This year, we’re debuting The Colette Book Club—an online book club that explores the meaning and making of clothing. In this club, we’ll read any book that enhances our understanding of sewing, from historical fiction to fashion philosophy. 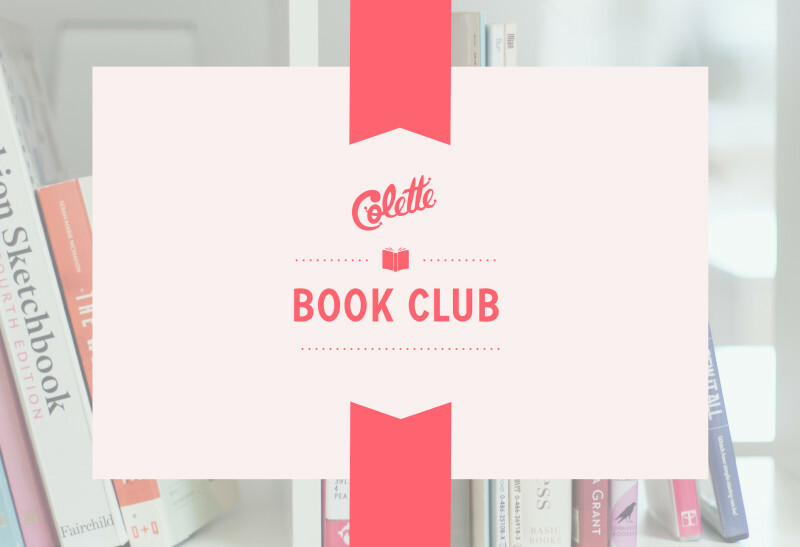 If you like to think about the roles that style and creativity play in our lives, you’ll love the Colette Book Club. We’ll read a new book every six weeks. You don’t have to finish the book to join in the discussion. Between discussion posts, you can chat about the book using the hashtag #ColetteBookClub. It’s time to dive deep into books that unravel hidden truths about sewing. Join us, won’t you? Our first book is The Forgotten Seamstress, a lovely novel by Liz Trenow that will delight mystery lovers, textile nerds and fans of Downton Abbey. This novel tells two stories. The first concerns Caroline Meadows, a 38-year-old Londoner. Caroline is a little depressed—her life is okay, but it’s not working out the way she planned. Then she discovers a beautiful quilt in her mother’s attic. The impeccably worked quilt presents a mystery: no one in Caroline’s family sewed it, and it contains patches of an exquisite century old silk woven exclusively for the British Royal Family. Caroline’s family has no connection to the monarchy. Where could these scraps of silk possibly come from? The second tale is the fantastical life story of Maria Romano. Maria (now deceased) claimed to have worked as a needlewoman at Buckingham Palace from 1911-1918. Most people who knew Maria thought she was delusional—after all, she had spent 30 years in an English mental institution. But even crazy Maria—or “Queenie”, as she’s known—has secrets that she barely dares to share. As Caroline tracks down the truth behind the quilt’s origins, her story entwines with Maria’s, and secrets are revealed that could change her life forever. We’ll discuss the book on this blog, six weeks from now, on February 15. We’ll announce the next book on the same day. fantastic! I’ll try to read it! This is a fantastic idea! I will certainly join the club! I am in. This looks like a great book. A perfect companion whilst listening to Seamwork radio when not sewing! As luck would have it, local library has a copy. I downloaded this book yesterday, it was suggested to me by my Scribd app! I’m excited to keep listening to it and discuss virtually with everyone. This is such a great idea! I just downloaded the book, its a fun way to take the sewing with me even on the subway. Oh! This looks like exactly the type of book I’d enjoy. Off to check it out! This is so strange, I got the book from my mother in law but it had been lying around for a few months and I just started reading over the holidays. I’ll be keen to hear what others think of it. Great Idea… I am looking for new book! Where do we join? perfect! The book is bought and downloaded. Oh, this is exactly what I need! I’ve just ordered a copy from my local library. Oh, you will love this book! I read it last year and it was very good! She wrote another one, too, about silk, The Last Telegram. Both are excellent reads! Fun! Reading is my oldest hobby love, so this sounds like the perfect way to enjoy both that and sewing. I just snagged it from my local library’s e-book collection, so I will certainly try to finish it in time. Yay! I love reading (though perhaps I will listen to this one while sewing!). Thanks! I am looking forward to this. Love this idea! This might be the first book club I can really get on board with! What a great idea, my two favourite hobbies, sewing and reading. I love being a member of a reading group as you read books that you would not otherwise have done, thank you whoever suggested this idea. From U.K. but now living in Spain. Always wanted to join a book club. This looks like it’s perfect. Thank you! Just downloaded it to my Google Books. Who Hoo! I am looking excited about this! Books & sewing I’m on cloud nine! ? I’ve got so many books on the go already, but this one just skipped the line to the front! There are six (well, now five) copies of the ebook available at the Toronto Public Library, and 17 hard copies available with one hold before you can get yer hands on it. Thank you Multnomah Co Library for loaning ebooks! Great idea, I will be looking for it on kindle. Has anyone read The Dressmaker, bought the book but not read it yet or seen the film, perhaps it can be included at some stage. I read it before the film came out. It’s a great easy read and very visually evocative. The film deviates a little bit not in a way that changes the story too much. Read it. You’ll love it. I’m not a fiction fan, but I love that you’ve put the emphasis on borrowing this from the library! Yay! I can’t help it, I’m a librarian! Fabulous idea! I will try to pick up this book this weekend. Off to the library! Thanks for the reccomend. :). Have you read The Pink Suit? Historical fiction about the seamstress who sewed the famous Kennedy pink suit. Excellent book. I have not read this. My next ‘stop’ will be my library’s website to reserve a copy. Thanks!! Having mini local meetings all around the world would also be a lot of fun! Anyone in Montreal, QC? What a great idea! I’m looking forward to a new book and to the discussion! What a lovely idea, the Colette team just keep surprising me! I’ve already got my copy, i cannot wait to read it! Sounds great! I’ll have to read it. This is such a good idea ! I was loooking for a new book for my commute and this sounds perfect. A new way to bring more sewing to my day to day routine. Hello everybody from Down Under. I read more than sew these days so this book sounds perfect and I have just reserved a copy from my local library. Oooh! I just put a hold on it at my library. Looking forward to reading it. Thanks! that discusses sewing. What a way to go. Thank you. Hi Jo, I’m glad you’re excited about it! I’m excited too. I have it on reserve and am anxiously awaiting the “ready for pick up” email from the library.! Just ordered it and will start reading right after I get done with Alex Cross ( a series written by James Patterson). What a great idea! I borrowed the book using the overdrive app and finished it today – thoroughly enjoyed it. Book bought and looking forward to getting involved. I was looking for an online reading club and this combines my two loves perfectly. Thank you for setting up! I read this book awhile ago and thoroughly enjoyed it. I also recommend Mrs. Lincoln’s Dressmaker and Mrs. Grant and Madame Jule, both by Chiaverini. Both are great historical fiction. I’m getting the download and audio book. so I can go back and forth. lol I listen while I work. sewing, cleaning or driving to and from. Fellow librarian here. If you announce the title 4-6 weeks ahead, it would give libraries time to interlibrary loan or buy books for people. I work for a small, stand-alone location and always feel bad when someone comes looking for a book-club book that they need to start reading that week to have the full time, but we don’t have it and by the time we get it, they will only have a week or two to read it. Thanks for the tip! We’re still working out the details so that’s really helpful. I’m hoping that the six weeks reading time will help with this kind of thing … but it’s hard to balance. Someone in this thread already downloaded the book and read the whole thing! I love this idea! I’ve been meaning to read sewing themed novels ? Love the idea of book club that encompasses fabrics. Looking forward to reading the first book. I have been looking for a book club in my local community here in Australia but I live too remotely for a satisfactory club experience. I have followed Colette online for quite a while. I always read and take a great deal out of her recommended reads. This book club idea is an exciting new dimension. I am going on line to get the book right now. That’s great! I hope you can give us some feedback as the club continues … it’s new for Colette and for me too, so we’re learning as we go. Just checked the e-book out from my library. I’m hooked already. Wonderful! Definitely going to join! Yay! Can’t wait to get started! That’s great! I should ask the Colette team if we want to make something similar for people to put on their blogs. I checked out the book last night and am enjoying it so far! Ooh! I’m all over this idea! So good! Yes, I am in! I just discovered this blog and have just begun to sew some of my own clothes. I already quilt and knit, so a new hobby wasn’t really needed, but I am just loving it even though I have so very much to learn! What a great site to visit! I am going to give the phoebe sew along a try and I think the read along will be great fun, my pattern and book are ordered and on their way. I can’t wait to start both! I hope I can keep up with the reading, with all my hand sewing and knitting in the evenings, I only have a short time to read before I fall asleep. What great ideas!! Not sure if you want suggestions for future books. I have read The Forgotten Seamstress and liked it. Another to try- not a novel- is “The Coat Route, on the Trail of a $50,000 Coat” by Meg Lukens Noonan. It is about a real tailor and his quest for the finest everything to make a coat for a customer. The author goes to all his sources: fabric, buttons, silk lining, etc and interviews the manufacturers. She even goes to meet the goats that make the cashmere- or is it vicuna? You meet the man the coat is for also. Very interesting for anyone who has ever sewn a garment. Check it out. Thanks! I’m absolutely taking suggestions for future books, and we haven’t gotten a lot for non-fiction so far. Putting this one on the list! Kat, if you are seeking non-fiction titles, I would recommend JJ Lee’s memoir on tailoring his father’s suit called The Measure of a Man. Somehow I managed to read this all in one night while traveling – it’s been a while since I got so drawn into a novel! Great book – looking forward to the discussion in a few weeks! I enjoyed reading this book a few months ago. I love books with sewing and knitting in them! Thanks for putting together this book club. Finished! Thank you for the reading suggestion, I have really enjoyed it! Looking forward to the next book! Can’t “seam” to put it down! What a fantastic choice. As a librarian, I want to say THANK YOU, thank you, thank you for linking to worldcat in your post! This makes me ridiculously happy. As a reader and seamstress I can’t wait to read this book! February 15th seems so far away. I am like a child that can not wait for Christmas. I have read the book, stayed awake all night to finish it. Just hope I won’t forget anything once we start discussing it after all I will be turning 75 years young shortly after out first discussion. Sounds great, already have the book in the TBR pile. Also a librarian, sewist, and have been running an online book group for over ten years now, looking forward to combining love of sewing with love of reading. There is also another non-fiction book with the same title as one mentioned above “Measure of a Man” but this one is called Measure of a Man: From Auschwitz Survivor to Presidents’ Tailor – Martin Greenfield, about “America’s greatest living tailor” if anyone is interested. If anyone is wondering, it’s a good book! I have been listening to it on Audible. The narration is really good and the story is really intriguing. I hadn’t heard of this book previously but I’ve just read the first chapter and I’m hooked already. Thanks for the recommendation. I finished it in one day!!!! I got sucked in immediately and I will be re-reading it soon! As a sewist and reader, this book was doubly appealing and a great pick for a book club read! I’m a little late to the party, but I’m so excited to read the book and join the club! Excited to join. Combining two of my fav passions, sewing and reading. What a fun project! I’m so excited to join. Is anyone in London, do you fancy a face to face meet up following the online chat? Just finished reading it. Enjoyed the story ! Thank you, again, for suggesting this book. Thoroughly enjoyed it! And more so when I found some interpretations of Maria’s quilt using the free pattern -http://liztrenow.com/bringing-marias-quilt-to-life/. Can’t wait to discuss with you all!